Jumpsuit has padded "muscle chest and arms"
How were you at track when you were in High School? Maybe you went to state. Maybe you've seen quite a few trophies in your day. That could count as fast as a speeding bullet in our opinion. Sure, it might be a bit of a stretch but just go for a few jogs and you'll get it down in no time. What’s the next part of that iconic phrase? Oh, yeah! He's more powerful than a locomotive. Well, these days with the power of the internet, anyone can be more powerful than a locomotive. A good hacker can take down a locomotive we'd bet. There would be no need to get in front of it and mess up your work shirt these days. Good thing too, we're sure the train company would appreciate you not messing up their front bumper when you've got a high-tech option. Now, leaping over tall buildings in a single jump is something we can't help you with. Those are just cool skills from Krypton! 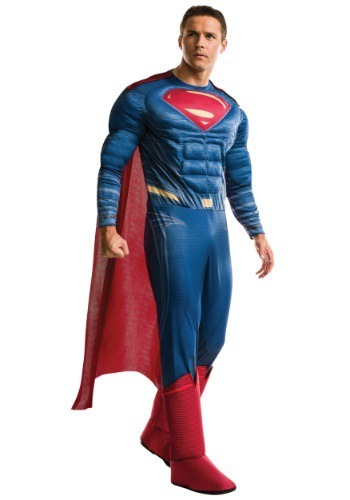 You don't have to worry about that high jump in order to qualify to wear this sweet Superman jumpsuit. You'll look like the timeless Super Hero instantly with the muscle torso and red cape. We're ready to see you celebrating Halloween side by side with Aquaman and Wonder Woman. It's going to be a world-saving time, all working together. But don't worry, people are still sure to shout, "It's a bird, it's a plane, its. . . well by golly, it's Superman!"